Apart from the fact that the former Watford man is the leading scorer in the Africa Cup of Nations qualifiers with six goals to his name, Ibitoye also highlighted the fact that he has been scoring goals left, right and centre for his club and he's high on confidence after firing blanks at this summer's football festival in Russia. ''It is a big miss, somebody who has scored six goals in his last three games, an average of two per game will surely be a big miss,'' Ibitoye said to Channels Television. ''He has overcome the lack of confidence that he had at the World Cup, now he is firing on all cylinders. He's scoring a lot of goals for his club, he is in the mood, so we are going to miss him. ''It's an opportunity for somebody else to step up. We have a lot of options in our attack - young, intelligent, talented players. 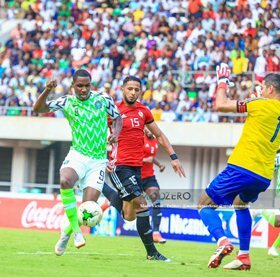 Apart from Ighalo, Super Eagles manager Gernot Rohr will not be able to count on the services of three players that he would have named in the starting eleven against Bafana Bafana for one reason or another. While Elche's Francis Uzoho and Bursaspor's Abdullahi Shehu have withdrawn from the squad due to injuries, Leicester City midfielder Wilfred Ndidi picked up his second caution against Libya to trigger an automatic one-match ban.